1. National Cancer Institute. Ovarian epithelial, fallopian tube, and primary peritoneal cancer treatment (PDQ)—health professional version. Updated January 2017. www.cancer.gov/types/ovarian/hp/ovarian-epithelial-treatment-pdq. Accessed January 19, 2017. 2. National Cancer Institute. Cancer stat facts: ovarian cancer. https://seer.cancer.gov/statfacts/html/ovary.html. Accessed January 19, 2017. 3. Pal T, Permuth-Wey J, Betts JA, et al. BRCA1 and BRCA2 mutations account for a large proportion of ovarian carcinoma cases. Cancer. 2005;104:2807-2816. 4. National Comprehensive Cancer Network. NCCN Clinical Practice Guidelines in Oncology (NCCN Guidelines): Ovarian Cancer: Including Fallopian Tube Cancer and Primary Peritoneal Cancer. Version 1.2016. June 30, 2016. www.nccn.org/professionals/physician_gls/pdf/ovarian.pdf. Accessed January 23, 2017. 5. US Food and Drug Administration. FDA approves Lynparza to treat advanced ovarian cancer: first LDT companion diagnostic test also approved to identify appropriate patients. Press release. December 19, 2014. www.fda.gov/NewsEvents/Newsroom/PressAnnouncements/ucm427554.htm. Accessed January 23, 2017. 6. Lynparza (olaparib) capsules [prescribing information]. Wilmington, DE: AstraZeneca; October 2016. 7. Sehouli J, Braicu EI, Chekerov R. PARP inhibitors for recurrent ovarian carcinoma: current treatment options and future perspectives. Geburtshilfe Frauenheilkd. 2016;76:164-169. 8. US Food and Drug Administration. FDA grants accelerated approval to new treatment for advanced ovarian cancer. Press release. December 19, 2016. www.fda.gov/NewsEvents/Newsroom/PressAnnouncements/ucm533873.htm. Accessed January 19, 2017. 9. Rubraca (rucaparib) tablets [prescribing information]. Boulder, CO: Clovis Oncology; December 2016. 10. Clovis Oncology. Facilitating Rubraca delivery to your patients where and when they need it. http://rubracaconnections.com/pages/hcp_specialty_pharmacies_wholesalers.html. Accessed January 23, 2017. 11. Business Wire. Clovis Oncology presents efficacy and safety data from New Drug Application (NDA) population for rucaparib in the treatment of advanced mutant BRCA ovarian cancer at 2016 ESMO Congress. Press release. October 7, 2016. www.businesswire.com/news/home/20161007005279/en/Clovis-Oncology-Presents-Efficacy-Safety-Data-Drug. Accessed January 26, 2017. 12. Swisher EM, Lin KK, Oza AM, et al. 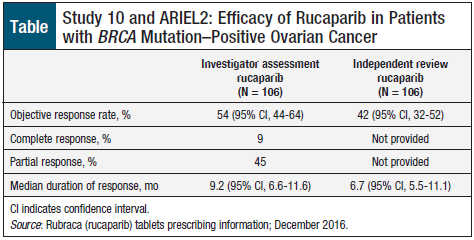 Rucaparib in relapsed, platinum-sensitive high-grade ovarian carcinoma (ARIEL2 Part 1): an international, multicentre, open-label, phase 2 trial. Lancet Oncol. 2017;18:75-87. 13. ClinicalTrials.gov. Rucaparib. Search results. https://clinicaltrials.gov/ct2/results?term=rucaparib&Search=Search. Accessed January 23, 2017.